Our main product for tank covering, replacing conventional steel cover in many uses, including atmospheric oil tanks. During the last years many tanks have been updated with this technology in order to avoid water filtration and reduce emissions. 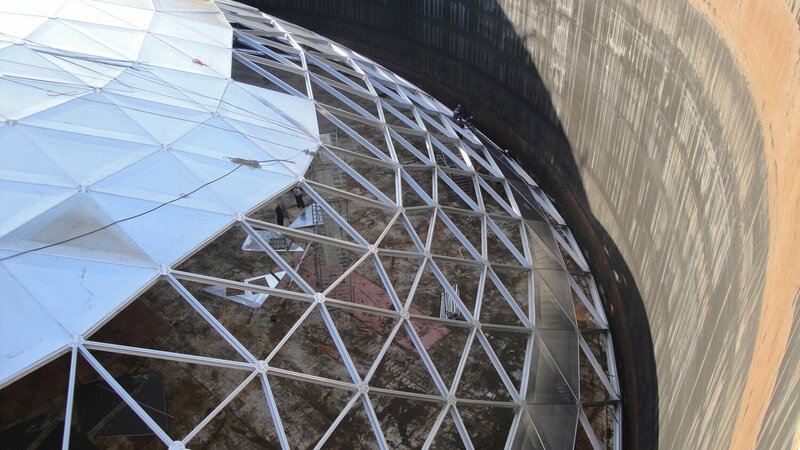 These domes are self-supportive, light and maintenance free. Aluminium domes are a long term investment and a valuable asset for tank owners. CTS manufactures a wide range of primary and secondary seals for petrochemical storage. Our seals include shoe type, compression plates and special uses. These seals are designed for both external and internal floating roofs. Materials used during manufacture ensure the seal to be suitable for the stored material in the long term. CTS seals design allows your tanks to use their maximum capacity. CTS designs and provides internal floating roofs to reduce emissions. Our designs include different types of floating roofs as direct contact or pontoon type, all designed and manufactured under API standard 650, appendix H and other relevant requirements to suit our client’s needs. In addition we can supply a wide range of seals for internal floating roofs, both for new and modified facilities. CTS has gained a wide experience, updating external floating roofs into tanks that have a dome covering an internal floating roof. Some of our projects include internal floating roofs hanged by cables, discarding support legs in the tank’s bottom. Draining rain water from external floating roofs is not only important for maintenance but also avoids the possibility of roof sinking due to the water’s weight. CTS offers different solutions: Drainmaster system (flexible joint pipes), conventional fixed joint pipes and drain hoses (100% resistant to aromatics and hydrocarbons. Floating suction systems are used inside oil tanks and other fuels used for aviation. These systems are suspended on the liquid’s surface so extraction of product is made where it’s cleaner and denser no matter level of the liquid. For floating roof tanks skimmers move with the roof to extract unwanted liquid. CTS provides a wide range of floating suction, from 2” to 30”, designed for horizontal or vertical tanks, together with floating or fixed roofs. Materials used are: aluminum, carbon steel and stainless steel. - Tank Automation and measurement. - Tank internal heating and mixers. - Volatile and vapor recovery systems. - Tank interconnections of pipes and valves.